Bianca Pitzorno talks to us about the writing process of her two books The Littlest Witch and Lavinia and the Magic Ring. Your books have been translated into many languages and have been published all over the world. How do you feel when you see your stories written in a different language? When my books are translated into a language that I don’t know, my first reaction is a feeling of curiosity intertwined with a bit of mistrust. For a writer, it’s the words that are the most important part of the writing process, the words through which she or he is able to tell the story. Words come even before the plot, characters, dialogues and setting. To see one’s words being changed always brings a slight feeling of bewilderment. But to discover that the text has been most faithfully translated provides a sense of relief. There is also a certain feeling of satisfaction in knowing that the number of readers is growing. Many of my books have been translated into languages that are completely unknown to me: Chinese, Japanese, Turkish and even Thai. Of all my books, Lavinia and the Magic Ring has been translated into the most languages. Every time I see my books printed in a language that uses a different script from ours, such as one you must read vertically, or maybe from right to left, I feel a deep sense of wonder. I know very well that a different language often equals to a different culture and different ways of living, and I always I ask myself what my new readers will think of my story. I absolutely love reading books from countries that have a language different to my own – it’s through translated books that I am able to discover new worlds and that gives me happiness. 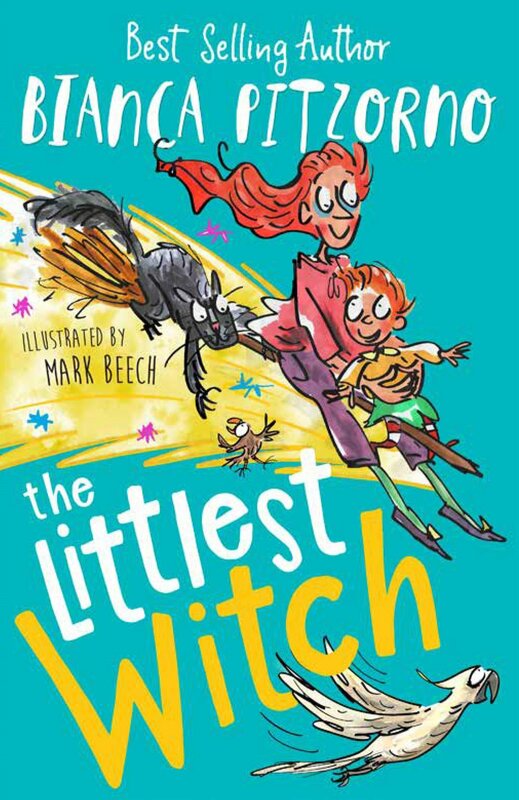 Where did you get your inspiration for the characters of The Littlest Witch? While I was researching to write the biography of Sardinia’s heroine Eleonora d’Arborea – a medieval princess - I stumbled upon a terrible book, Il Malleus Maleficarum. This was the manual used by the 13th century inquisition to interrogate those poor women who were accused of witchcraft. In this book are listed all the ‘signs’ for inquisitors to recognise a witch – even when the woman denied it. In order to force women to confess witchcraft, the book recommended to use very violent means, real tortures. Even my hero Eleonora had inserted a few laws against ‘witches’ in her law codex called ‘Carta de Logu’. In the same years I was writing the biography of Eleonora d’Arborea, I also published a short novel called Portrait of a Witch, which told the story of the martyrdom of a poor peasant girl who, as witch, was blamed for the plague of 1600. My editors repeatedly asked me to write a children’s book about witches, but I really didn’t want to write about any of the tortures and cruelties that happened in real life. Therefore, I decided instead to ridicule what the inquisitors did to unmask witches. I took all the typical signs used to recognise a witch – such as red hair, floating on water, flying on brooms, not having a reflection in mirrors, speaking to your servant animal. I decided to place such traits on a modern-day baby girl, who belongs to a contemporary family averse to superstition. Everyone in her family can see these signs, but they decide to ignore them completely so that Sibylla would be able to live a quiet and happy life - even with all her special traits… This is only if she didn’t meet Alfonso, a witch hunter who is ignorant, rude, superstitious and greedy for money. It’s always through obstacles like the ones I mention; through ‘knots’ that tangle up our everyday lives, that stories are born – at least, according to Aristotle. In your later years you have been writing books mainly for an adult audience. What are the main differences you have found in writing for children compared to writing for adults? I started writing for adults at the same time that I was writing for children and I continued doing this the whole time I was publishing children’s books. For example, I wrote the biography of Eleonora d’Arborea in 1984, the same year that I wrote The House in the Tree. By chance, I just had more luck and success with children’s books rather than those intended for an older audience. I haven’t, however, written using two different styles- one for adults and one for children – I always address my readers with great respect. Of course, for a younger audience I pick topics that are relevant to their experience and to what they are going through, but my style remains the same. Between the seven Zep sisters, is there one that you prefer? Sibylla, naturally. She is innocent and unaware of her ‘differences’. Lavinia is not a typical little match girl, and she has quite a the character. Are there any aspects in her that could be an example for modern girls? No. Lavinia cannot be used as a role model. She is a poor little girl, yes, but it’s a stereotype of children’s fairy tales that poor girls are always nice. Lavinia is vain, bossy and she does not hesitate for one second if she needs to blackmail someone to obtain what she wants. Luckily, she is surrounded by wiser friends and she is clever enough to understand that she needs to follow their advice. Quentin Blake is one the most loved illustrators in the UK. How was it working with him on Lavinia and the Magic Ring? When he illustrated Lavinia and the Magic Ring, Quentin Blake was already a ‘veteran’ of my books… He was accustomed to my style - having already illustrated The House in the Tree, Listen to My Heart, Polissena del Porcello, Diana, Cupid and the Commander, King Midas Has Donkey Ears, Tornatras. As he had always done for my previous books, Quentin read the story word by word, to understand the atmosphere around the characters and not only the plot outline, drawing the illustrations with the same professional style that distinguishes him. I will always be grateful to him for all his work. Bianca Pitzorno is considered the Italian Roald Dahl and has already been translated into many languages. She has won the Anderson award 6 times (85, 89, 88, 92, 95, 2001), has been nominated twice for the Hans Christian Andersen Award and has won several more awards for children’s literature in Italy. She has been nominated Italian UNICEF Goodwill Ambassador. Catnip is to publish two titles in 2018 translated from Italian, The Littlest Witch and Lavinia and the Magic Ring, with the latter title being illustrated by Quentin Blake. Bianca lives in Italy.